I’m not a New Year resolution kind of girl. The whole new year to start over by making promises that I and the rest of the world won’t keep, just doesn’t work for me. I was never a person that went along with what everyone else was doing. Peer pressure? I don’t get it. Even as a teenager I got angry when someone else tried to tell me what to do. I have always liked being an individual. I decided today that I will make my new year from birthday to birthday. I feel like I’m well on my way to making change and progress in my life. I’m six months into my 365 project, and at over two hundred posts and art projects, I think I’m finally fulfilling a lifetime of empty promises. My resolutions for this next year? To see this project through. That’s an easy one. The other is to open our business. That is a huge project. We are under no delusions about the amount of work ahead of us, but we are both in the mind-set that we need to move ahead. Yesterday’s stolen iPhone was just the cherry on top of six plus months of not great luck. Dan and I are quite talented together and I think it’s time to begin making our own luck. That and there’s nothing I love more than a new space to decorate, I’m itching to get my hands on our shop. We have some small pieces ready to go, and some roughly halfway there. This is the first week of getting our act together. I’m excited about this next year, and hope to make this next twelve months the best of our lives. Today I saw a photo in The New York Times that really appealed to me, but since I have vowed to only use my own photos for my work, I instead asked my always supportive husband to pose for me. The photo in the paper was a woman, I have instead painted a man. There was an anguish in the body language that spoke to me, as I said we haven’t had great luck lately. Maybe I should have painted a picture of me hunting down the thief that stole the phone, or of Dan and I sitting in our business. ( You know, for visualization purposes) Funny thing is I’m not even angry anymore, I’m ready to move past it. As I said yesterday I’m trying to let stuff go. There’s always something else to focus on, like being happy. And on that note, in my woe is me I had a crappy birthday post, I failed to mention that Dan cooked an incredible Greek dinner for me, and that he and the kids gave me lovely gifts, but what’s more important, they wrote very supportive words of love and encouragement for my art. There’s always a silver lining. 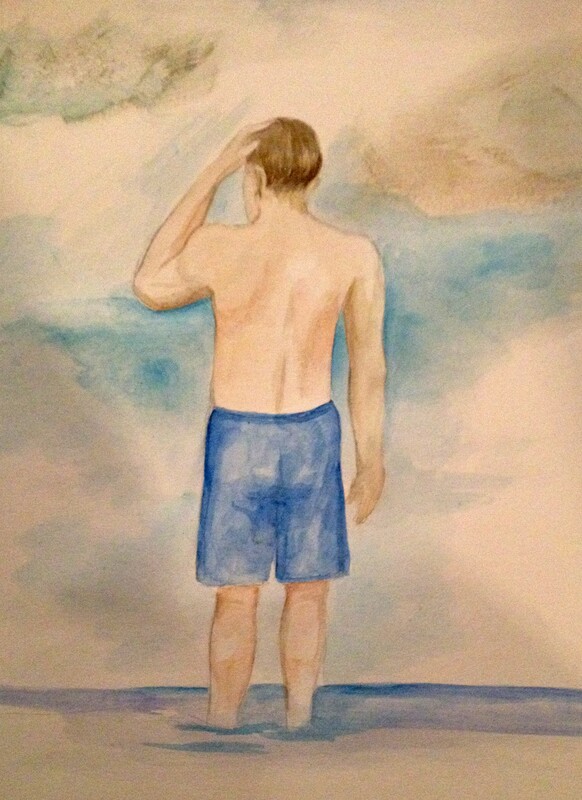 This entry was posted in art, Art and my life, Drawing, Family, Fine Art, Uncategorized, Watercolor, Words, Writing and tagged art, drawing, Family, Fine art, Goal, illustration, life, loving words, New Year's resolution, painting, projects, Struggle, thoughts, Visual arts, writing. Bookmark the permalink.